We are starting the BM#58 edition and for the first week I will be sharing some Dry Vegetables. The need came up with we all cooked up thalis during September Mega BM and it felt like overload when we had to post about 10 plus recipes for the same day. Since many had leftover posts, I thought we could have this to ease everybody. For the day one, I have a stir saute from Gujarat for the Gujarati Thali. Deciding on the potato was relatively easy decision. 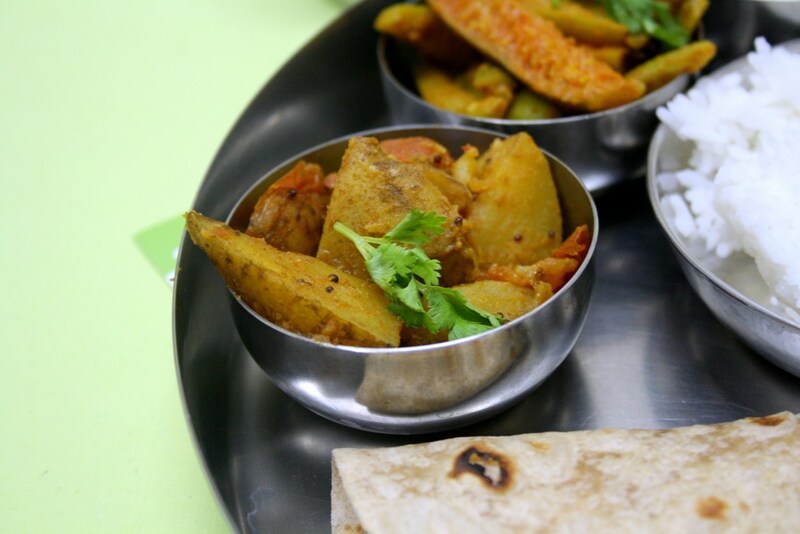 Given the love everybody have for the spud, I decided I was going to make one potato dish for all the thalis. One can't be having a feast and not cook up everybody's favorite right. Given that, this potato Stir fry was a hit. 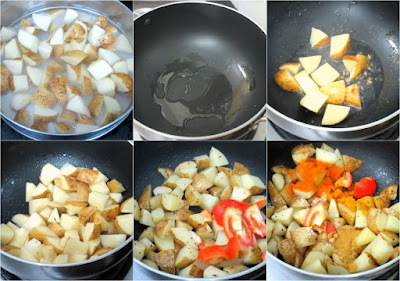 Though its much the same as your regular potato fry, it still was different. Anyway I didn't have qualms preparing it again on demand. We have a Monsoon coming up and during the weekends its been raining mid noon. The weekend showers were so bad that Monday was declared holiday. After an unexpected hiatus for about two weeks, I was getting back to cooking. I planned for some interesting topic that I will share soon. So two dishes got done for that. Of course I have the Bake-a-thon coming up, which seem to be tossing between two topics. Whatever it is, that topic will surely make my kids go gaga and my friends say not again! So I am sure you have guessed what I am planning for the December. Anyway that's update on the home front. 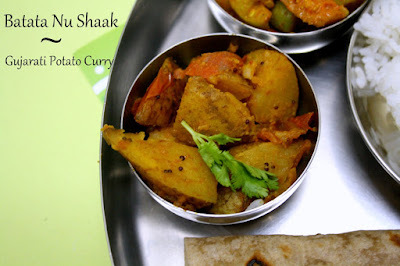 Hoping I will have the dishes prepared ahead, here's a simple Batata Nu Shaak, I love the ring the term has! The recipe is from here, travelled from here. Heat oil in a pan. Add the mustard seeds. When it sputters, add the cumin seeds and hing. Next add the cubed potatoes. Saute for a couple of minutes. Now add the turmeric powder, chilli powder, cumin powder and coriander powder. Saute for another minute. Cover with lid for few minutes. Add the chopped tomatoes, sugar and 1 cup of water. 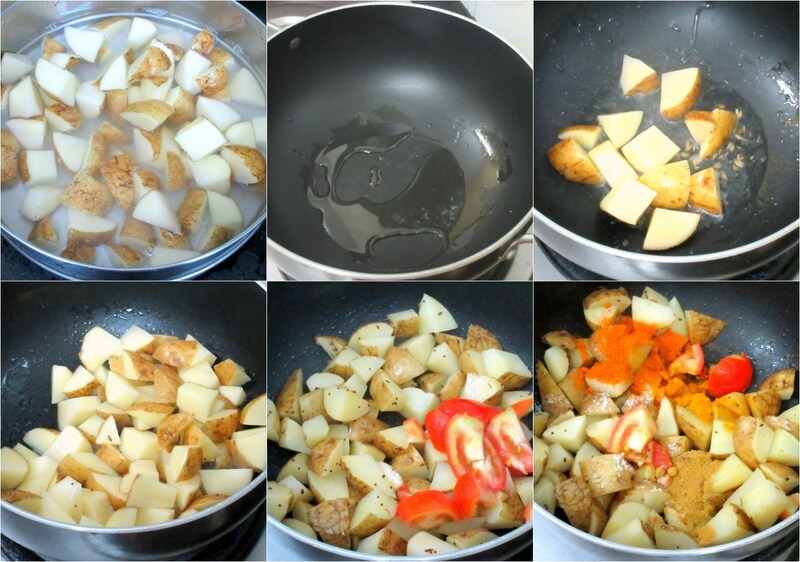 Cook in low flame till all the water is absorbed and the potatoes are cooked.